Volumetric Technologies designs and manufactures the highest quality Rotary and In-Line Unscrambling and Accumulating Equipment in the industry to meet a wide variety of needs. Our Rotary Accumulation Tables are precision designed and built to last. The Volumetric Technologies Rotary Accumulation Table is engineered to unscramble bottles, jars, cans or containers of any material. After the containers are loaded onto the optional transfer table from their shipping cartons, they are pushed onto the stainless rotary table. 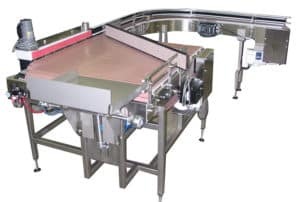 The rotary motion and dynamic unscrambling arm gently moves your containers to the outside edge of the rotary table to form a single line and are discharged one at a time, unaided, onto the conveyor of a filling, capping or labeling line. The Rotary Accumulation Table is positioned at the end of a production or conveyor line where your containers gently collect on the rotary stainless steel surface. The completed products can be held there for an operator to finish pack off of the finished containers. The Volumetric Technologies Inline Unscrambling Table is engineered to unscramble containers of various sizes and shapes. Designed to not damage the printed surface of containers, these tables are ideal for glass bottles with silk screen printing.